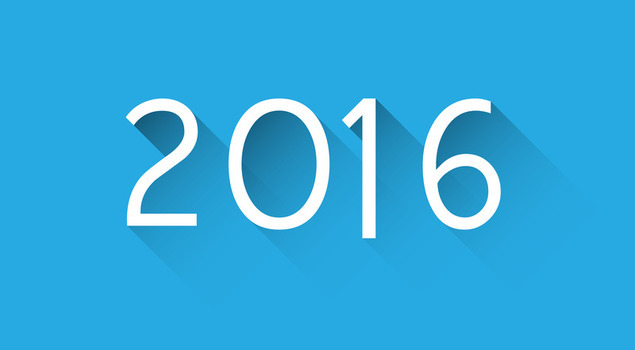 Happy 2016 new year word over blue. Vector paper illustration. This was the year the PC came roaring back. After years of downward spirals brought on by smartphones and tablets, the traditional PC sprung back to life this year, driven by the successful release of Windows 10 in 2015. Windows 10 was the cure for the sales slump brought on by the hugely unsuccessful Windows 8, and its combination of advanced security and friendly features made it a must-have this year. While desktop PCs continued to languish, serving mostly offices, laptops saw signs of life as several companies began to build excellent, reasonably priced laptops. This was the year businesspeople discovered the gaming laptop. A gaming laptop is a heavier, larger laptop with robust specs that allow even the toughest games to be played. This means they’re also great for pretty much any business program you would use. Gaming laptops were the big winners this year, as businesspeople realized that if it’s worth bringing a laptop, it’s worth bringing a capable one. 12-inch laptops may be light, but for the most part they’re useless. It’s finally possible to say that you own Microsoft hardware without blushing or dipping your head in shame. Microsoft’s latest Surface laptops are as good or better than any compact laptop out there, even Apple’s Macbook line. I expect Microsoft to continue to dominate this space in the coming year as they have the money to do pretty much anything they want, and they finally seem to have a design team that knows what they’re doing. Now they just need to cut it out with the annoying commercials. This wasn’t the best year for Apple. The refresh of their Macbook Pro was way too late and the compromises it brings, like the loss of the friendly MagSafe connector, meant a couple of loud thrashings in the media. While their devices don’t explode (at least), they’re standing at a disadvantage among those who want a stylish, light and powerful laptop… possibly for the first time ever. Now that Microsoft got its act together and created an operating system that works as well on desktops as it does on tablets, the standalone (non-Windows) tablet space is really tanking. It seems like a decade since there was anything really interesting in the Apple lineup, and the real winner in the space has been Amazon’s supercheap line of Fire tablets. Costing as little as 10% of the typical price of an iPad, it’s hard to care that they’re not really durable or fast when they do what they need to do. With phone sizes reaching close to 6″, it’s hard to really understand why you would pay $750 or more for a standalone tablet, especially if it doesn’t run the programs you want. But then it’s hard to count Apple out. Their successes in the last 20 years have been pretty astounding, and while they’ve faltered a bit since they lost Steve Jobs, I expect that they won’t let go of design leadership that fast. Maybe 2016 was a wakeup call for them, and we’ll see really revolutionary products in 2017. Are you using too much power on your desktop? How did USB take over the world?